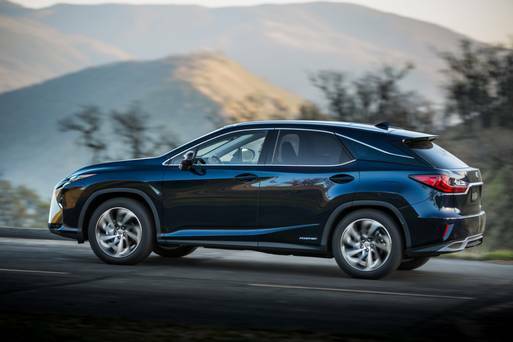 I found it difficult to start this review of the new Lexus hybrid SUV, the RX 450h, without initially overlooking the main elements in favour of what many would consider a small, if important, detail. Let me explain. It has a state-of-the-art way of letting you tell it what to do – through a 12.3ins screen. And I thought it took the biscuit. I am not normally that impressed with such items as they can be complicated and fussy. And I’m not bothered if it is an expansion of existing platforms, I found it reassuringly easy, intuitive and got it to do all sorts by ever so slightly touching a little pad just where my left hand fell naturally. It took me a little while to get used to how sensitive the pad was; initially, it was as flighty as a nervous lad on his first date. But to shift between the (hands-free) phone, ventilation, SatNav, radio, energy-consumption indicator and so on, it was excellent. I felt if I didn’t mention it at this stage, I would have done it an injustice. I think there are probably more sophisticated ‘interfaces’ (the Volvo XC90’s is more like a tablet), but this is a considerable contender for the user-friendliest because you don’t have to click down through several layers to get where you want to. The screen is set in the midst of possibly the best dash/instrument design and display around – again, the Volvo and it are neck-and-neck. I liked the leather part of it on the two-tier dash. It’s not a motor to take your breath away on the outside (typical, large SUV) except for that dramatic front/grille but lots of people – including two discerning daughters – were prompted to say “nice car” when they sat in. Believe me, that’s a compliment. With tailored leather upholstery (mine had cream and brown – lovely), there aren’t too many cabins as well designed or comfortable. It has a bit of leeway to play with because it doesn’t have a seven-seat option, unlike several rivals. I’m in two minds on whether that’s a plus or a minus. In the absence of a third row, you get a roomy cabin (thanks to the car being longer/wider and with 19mm lower seats, too) and a boot with a practical three-part stowage slot at the front to keep stuff from rolling around. But some people like the insurance of two more occasional seats for the smaller children when the occasion demands. It’s a matter of needs. From a driving perspective, the RX 450h isn’t going to earn as many plaudits, I’m afraid. It would be unfair to overly whinge about what is a pliant rather than engaging suspension/chassis because that’s not really what buyers of this car are looking for. Others, and I am among them, do like the bit of an edge that you will get with the likes of BMW X5, Audi Q7, Porsche Cayenne and Range Rover Sport. On the other hand, this was spritely enough out of the blocks (0-100kmh in 7.7secs) and there was plenty of mid-range pulling power (80kmh to 100kmh in 5.8 secs is decent). The V6 engine produces 262bhp on its own but overall power is 313bhp from the combined hybrid system. No doubt, I would have liked greater rigidity and tauter damping overall (there is a system in higher grades that helps in that respect). It was fine on the open road, but less so on smaller routes and over sharper undulations. The hybrid system on the 450h version has an electric motor on the rear axle, so I had all-wheel-drive when warranted. That motor can also help charge the battery when the car is in regenerative brake mode. It felt exceptionally well built and even with the engine humming away, the level of noise was minimal. I enjoyed my time with it, my major complaint being that lack of a bit of driving verve. Much of that can be overlooked in the real-life scheme of things because personal preferences differ so much. But I think most people would agree that it’s a far more competitive, luxury package now – and it’s got an ‘interface’ that adds a distinctive touch of class. Lexus RX 450h hybrid Crossover/SUV: 3.5-litre V6 petrol (262bhp) + electric motor (total 313bhp); 5.2litres/100km; road tax €200. Prices start €69,650; Luxury €76,450, F SPORT €83,950; Premium €86,250. Standard (Executive) spec includes leather upholstery, rain sensing wipers, adaptive cruise control, two-zone climate control, 18ins alloys, Lane assist, 10 airbags, 8ins info screen, fog lights, 4.2ins colour multi-information display, temp spare tyre. Luxury (tested) adds 20ins alloys, premium SatNav, 12-speaker audio, 12.3ins multi-information display, electronic climate control.